Space-age technology combines poly and burlap to give you a summer concrete curing blanket. 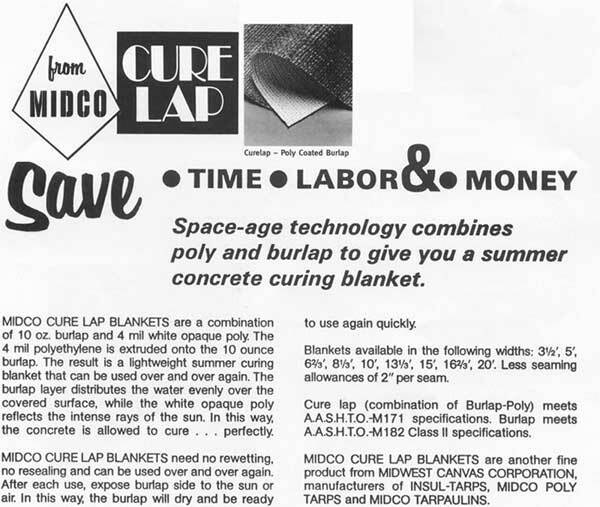 MIDCO CURE LAP BLANKETS are a combination of 10 oz. burlap and 4 mil white opaque poly. The 4mil polyethylene is extruded onto the 10 ounce burlap. The result is a lightweight summer curing blanket that can be used over and over again. The burlap layer distributes the water evenly over the covered surface, while the white opaque poly reflects the intense rays of the sun. In this way, the concrete is allowed to cure…perfectly. MIDCO CURE LAP BLANKETS need no rewetting, no resealing and can be used over and over again. After each use, expose burlap side to the sun or air. In this way, the burlap will dry and be ready to use again quickly. Blankets available in the following widths: 3-1/2’, 5’. 6-2/3’, 8-1/3’, 10’, 13-1/3’, 15’, 16-2/3’, 20’. Less seaming allowances of 2” per seam. Cure lap (combination of Burlap-Poly) meets A.A.S.H.T.O.M171 specifications. Burlap meets A.A.S.H.T.O. M182 Class 11 specifications. MIDCO CURE LAP BLANKETS are another fine product from MIDWEST CANVAS CORPORATION, manufacturers of INSUL-TARPS, MIDCO POLYTARPS and MIDCO TARPAULINS. Description: New patented Reflective Space Age Concrete Blanket R Value comparisions. 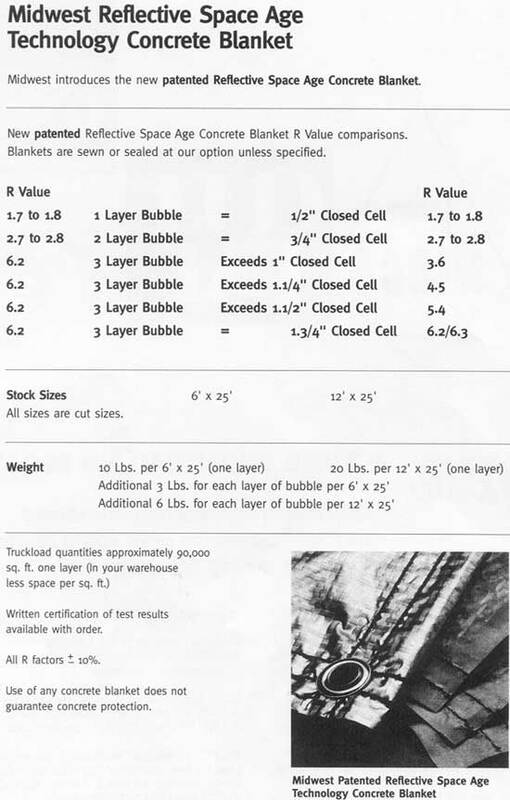 Blankets are sewn or sealed at our option unless specified. All sizes are cut sizes. Written certification of test results available with order. Use of any concrete blanket does not guarantee concrete protection.